for a long time friend and Under The Influence crew member Dominic “DASH 2000” Smith. He was known for being one of the founding members of the legendary Los Angeles graffiti crew UTI back in the ’80s. He constantly experimented with different mediums, was constantly sketching and painted, pushing his creativity for the rest of his adult life. The portrait was based on a photo taken by Eriberto Oriol, the loose smoke/cloud formations were painted by me, and Plek did the lettering. My cloud designs are a tribute to Dash’s deep respect and admiration for the Asian culture, which often influenced his own artworks. 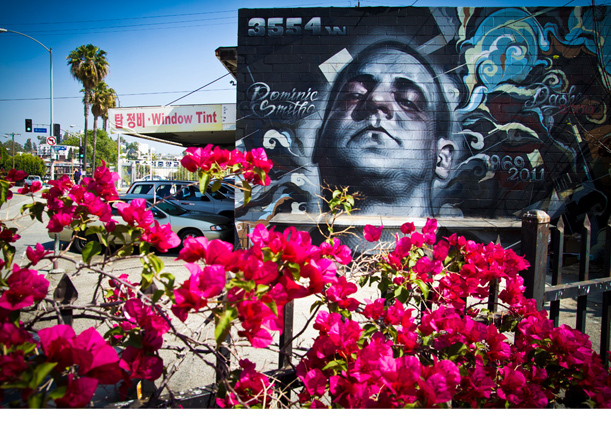 This was painted on a wall in central LA that Dash painted regularly, off of 1st street and Vermont in Los Angels. Dash passed away in 2011 from cancer.